Rosemary Sourdough Dinner Rolls | Have YOU Ben Starr Struck? I’ve been maintaining my sourdough culture for about 2 years now, and I just love the thing. I had always been hesitant to maintain a culture because of how much “work” I assumed it would be…regular feedings, complex calculations. It turns out that sourdough is FAR less picky than its reputation suggests. I’ve left my starter in the back of my fridge without feeding for up to 2 months at a time, and then made a perfect loaf of bread from it. I never schedule feedings anymore, I just feed it when I’m using it and it starts to get low. Sourdough has become every bit as simple as making yeast bread now! But since I have starter at all times, I’ve been experimenting with other ways to use it, like in pancakes, biscuits, and rolls, and this is my current go-to recipe for making dinner rolls. 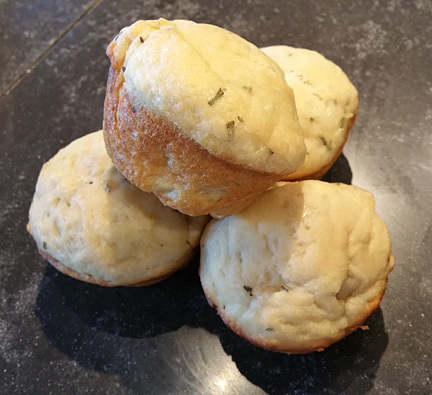 The rosemary is a great touch, and I have it growing in the yard so it’s always available and free, but you can easily leave it out for basic dinner rolls. As always with sourdough, you gotta give it time if you want it to be light, airy, and flavorful. So you should always plan on starting ANY sourdough product the day BEFORE you intend on baking it. Stir until everything is fairly uniform in texture. You’ll have a stiff batter, definitely not firm enough to knead. Then cover the bowl with plastic wrap and let it sit on your countertop for 12-24 hours. It will expand significantly, so make sure you have room in the bowl. Divide it into 2 bowls if necessary to prevent spill-overs. 3-4 hours before you’re ready to eat, spray two 12-cup muffin pans with cooking spray. Using an ice cream scoop (about 1/4 cup capacity) sprayed with cooking spray, scoop the batter into the muffin pan. Cover with plastic wrap and let it sit on the counter for about 3 hours to rise. This entry was posted in Recipes, Yeast Breads and tagged rolls, rosemary, sourdough, starter. Bookmark the permalink. Sounds so yummy. How do you a starter going? Ms. Shay, check out my post on The Best Loaf of Bread on Planet Earth. It gives instruction for creating a starter.